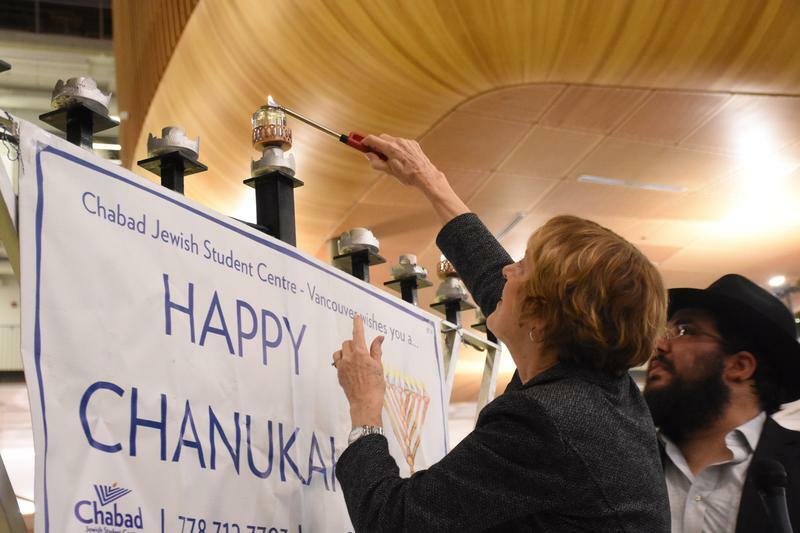 On Monday, Chanukah began at UBC with a lively celebration of the emergence of light in darkness and the Jewish victory against the Greeks over 2100 years ago. By all accounts, the celebration was a success, filling the Nest with around 120 people and providing an insightful example of Jewish celebration and traditions for all who wished to attend. The event was free and catered with potato-pancakes, apple sauce and donuts from Garden City Bakery, all of which were delicious. Not long after its start, the main event began with Rabbi Chalom Loeub, the coordinator of the event, taking the stage to thank those who made the event possible as well as attendees such as our interim President Dr. Martha Piper, who would be taking part in the ceremony later on. After these remarks, Martha Piper took to the microphone to deliver her thoughts on the occasion. She provided an interesting segment of UBC history about the cairn on Main Mall and how it was used by the students to demonstrate the collective difference made to the university’s history through many individual acts. “I think that’s what the lighting of the candles show — that each of us, by taking an action, can magnify the impact we have by being tolerant, by dispelling darkness, by accepting others and by increasing our knowledge. At UBC, we celebrate our diversity, we celebrate our tolerance, we celebrate our understanding of each other and we celebrate … the importance of education,” concluded Piper. After her speech, Rabbi Loeub presented her with a jewel-encrusted dreidel and thanked her for coming. The event was concluded by a raffle and the consumption of all remaining food amidst people playing Dreidel. The Rabbi Loeub’s son three-year-old son, Benny, took the stage and sung with impressive showmanship. He made for a fine conclusion to the ceremony. Rabbi Loeub’s next big event will be on January 22 in the party room of the old SUB. The event is called Chabad 100 and organizers hope to have 100 people for a Chabad dinner on campus. Rabbi Loeub also hosts similar events for Jewish students every Friday night at his home.